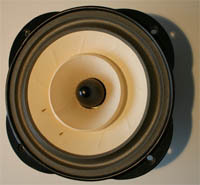 The purpose of this website is to share some observations, ideas and experiments on Lowther loudspeakers. 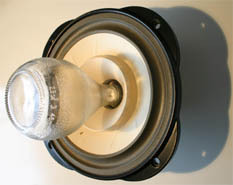 Lowther drivers are famous english high-end full range loudspeakers used in horn or transmission line systems, and sometimes bass-reflex systems. 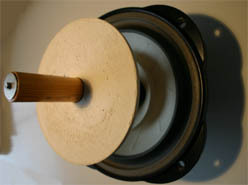 Those drivers offer a high sensitivity, an exceptional transient response and a wide bandwith. The result is an astonishing transparent sound, a rare ability to render the slightest detail, incredible dynamics and a very convincing soundstaging. Despite those qualities, Lowther drivers are handicapped by an overall rising and ragged SPL (sound pressure level) response, which has came out onto billions of discussions and tweaks, you can easily find on the web. This website is no more than another - and modest - contribution to this existential question : how to get the best from Lowther drivers ? The only difference I claim is an attempt to take advantage of some drawbacks, and not fight against. Anyone who practiced aikido will instantly understand what I mean. For my own, I chose to work on the Lowther SPL response in the high and midrange frequencies. Several interesting researches and realisations has been done sucessfully on the "bass part" : have a look to the projects section of Martin King's quarter-wave website. Highs : Lowther drivers are well balanced off axis, but in axis, the SPL response shows a 10 dB peak between 6KHz and 12KHz, which in my opinion deteriorate the reproduction of brass, violins and human voices ("acid" sound). This problem is due to the new profile of the inner cone, with a reverse roll. 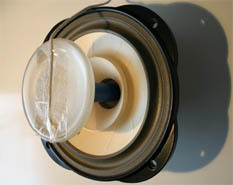 Midrange : Lowther drivers present an additional of energy between 700 Hz and 2 Khz, well known as "Lowther shout" phenomenon, although the problem has been alleviated by the new whizzer cone profile, with a reverse roll. I will tell you more later about the advantages and drawbacks of this new profile. 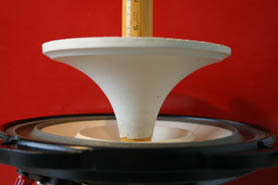 Some people try to flatten the SPL response using electric filters or dampening devices (cotton, foam etc.). But this approach leads to waste useful acoustic energy off axis. The philosophy of the work submited here is to "spray" the sound beamed in axis in all directions with specific phaseplugs, in order to get a more homogeneous SPL response in and off axis. That way, the need of filtering or dampening is not so evident. Moreover, you get a more omnidirectionnal driver, with more extreme highs at 30, 45 degrees, and even more according to the shape of the phaseplug. 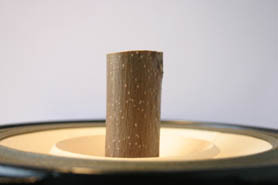 This enhances the feeling of presence of the musical instruments, although obtaining an acoustical pressure in a 360 degrees pattern - as provided by the musical instruments in actual fact - is far from being achieved (the maximum theorical is 180 degrees with a front firing driver). However, the directivity graph of the driver is more constant all other the audible range. You will find below several graphs of SPL response of a Lowther DX3 with hi-ferric coil fitted with different handcraft phaseplugs. The measurements were done at a distance of about 1m with a condenser microphone and a PC running Clio software. The driver was loaded by a 1m by 1m open baffle. Please do not consider datas below 100 Hz : they are simply non significant. I did not wrote any comment for now : I will give my analysis later. 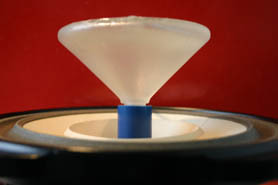 You can already make your own opinion about the interest of exploring the capabilities of phaseplugs. This approach comes from discussions with the "living audio encyclopedia" Jean Hiraga, Chief Editor of the french hifi magazine "La revue du son" (where I wrote my first articles 12 years ago). 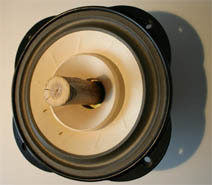 We talked about Beauhorn philosophy applied on the Lowther based Virtuoso speaker. 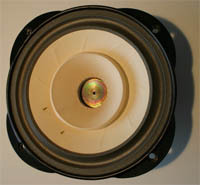 Beauhorn is an UK speaker and valve amplifier manufacturer. Many thanks too to Jean-François Guigue, a prolific and ingenious audio researcher and speakers builder, well known for his smart design of high-medium horn, which furthers and improves the work of Mr. Iwata. Jean-François Guigue kindly wellcomed me in his workshop in Paris to make the measurements, and provided amount of advices along many discussions about hifi (and sometimes photography !). Lastly, I have to thank Charles Rich, of Magavox, the french Lowther dealer based in the south of France, for the help given to this study, including drivers lending. Please feel free to give your comments : I'll try to answer promptly.